This article was originally posted in September, but with the current drought in California I thought it would be worth reposting. I'm sure most have heard by now about the record lows for precipitation California is having this year and the extreme drought that we are in. We've been encouraged to conserve water in every way possible. It's difficult to do, especially with little water loving kids around. But we've been vigilant. Taking shorter or less showers, teaching the kids to not let the water run for extended periods of time while washing hands, and not filling the kitchen sink as high when washing dishes. These work well, but there is also something that can help while the water IS running. Choosing WaterSense fixtures can help conserve water as well as helping your pocketbook (who still calls it a pocketbook?) When choosing a fixture you can look for the WaterSense label. These fixtures include bathroom faucets, showerheads, toilets and landscape irrigation valves. A WaterSense bathroom faucet uses a maximum of 1.5 GPM (gallons per minute). A standard faucet is 2.2 gallons per minute. Over time, this really adds up. Another option is to install a WaterSense aerator which can cost less than $5! 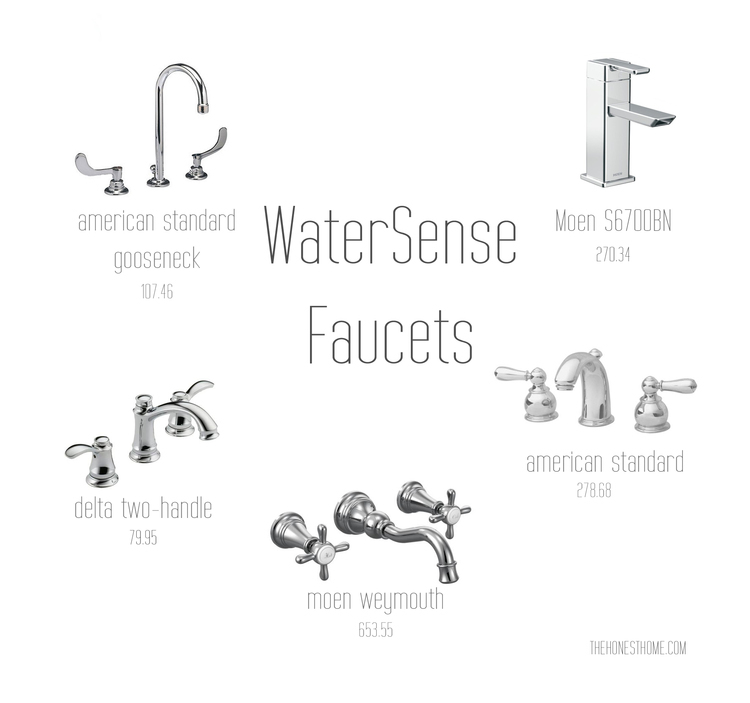 Pictured above are some of my favorite WaterSense bathroom faucets right now. They can in various price points and you can find information about each one below. While I wait for hot water in the shower or faucet I collect it to water outdoor plants. We have a small back patio with no built in-irrigation so this is sufficient for our watering needs. I also save the water from drinking cups, obsessive as it might be, it's easy to just collect at the end of the day and toss into the pot of a thirsty plant. Only do laundry when you have a full load. If you must do a small load make sure to change the water level as well. Same goes for the dishwasher, wait for a full load. Use native and drought tolerant plants in your yard, and better yet...ditch the lawn. So many good reasons for this, not just water usage. It looks beautiful, less maintenance and it reduces pests. Remodeling or designing a new home? Replace old toilets. Look for toilets that use 1.6 gallons per flush or less. A family of four can save 14,000 to 25,000 gallons of water per year according to Energy Star. Locate the hot water heater, laundry room, kitchen and bathrooms as close together as possible. Don’t put in that pool, go to the community pool instead. Swim with friends, save some money! Energy star dishwashers and washing machines save a significant amount of water (and electricity). What are some ways that you save water at home?